I’m exhausted right now. Want to know why? Here’s a partial list: Doughless potato knishes, cabbage kugel, chocolate chip cookies, crispy shallot breaded chicken, marinated almond crusted chicken, butternut squash kugel, and of course, apple kugel. All for passover. All made after I got home from work the last two nights. I am a little breathless thinking about the multitudes of food I still need to cook, but I had to stop and post my apple kugel recipe. I searched and searched every corner of the internet for a proper Apple Crumb Kugel for Passover, and came up empty. I am sure one exists, but I couldn’t find it. And so I set out to make up my own recipe. I am not simply happy with this recipe, I am thrilled. It’s delicious, and has an amazing texture you don’t often find in Passover food. I’m going to stop my exhausted rambling now, and post the recipe. I’d love to sit and shmooze, but I have food in the oven and eyelids to prop open. I hope you make this super easy kugel. And I hope you love it, just like I do. Preheat oven to 350. Lightly grease a 9×13 baking pan and set aside. To prepare filling: Place thinly sliced apples in a bowl, toss with lemon juice (immediately to prevent browning) and sugar. Set aside. To prepare crumbs: Mix together the lady finger crumbs, ground almonds, sugar and baking powder (if using) in a large bowl. Add the egg and oil and stir with your fingers until coarse crumbs are formed. Place a little less than half of the crumbs on the bottom of the prepared baking pan. Spread the apple filling evenly over the crumbs. 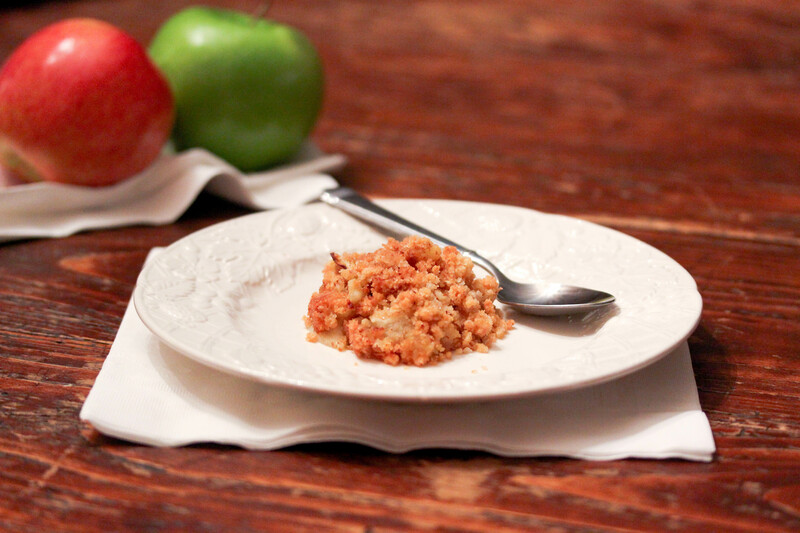 Pour remaining crumbs over the apples, spread in an even layer to ensure all apples are covered. Bake at 350 for about 40 minutes, until golden brown on the top. Note: the kugel was very thin when made as directed above. Next time I make it (there will definitely be a next time!) I will probably try baking it in a 10 inch round pan to make a slightly higher kugel. I tasted this recipe. It is AWESOME. Try it. You won’t believe it’s a Passover recipe. Thank you, Miriam! i thought u cant use baking powder on pesach? I am quite new in passover this year. That’s why looking for some special dishes. Really some special from you here. 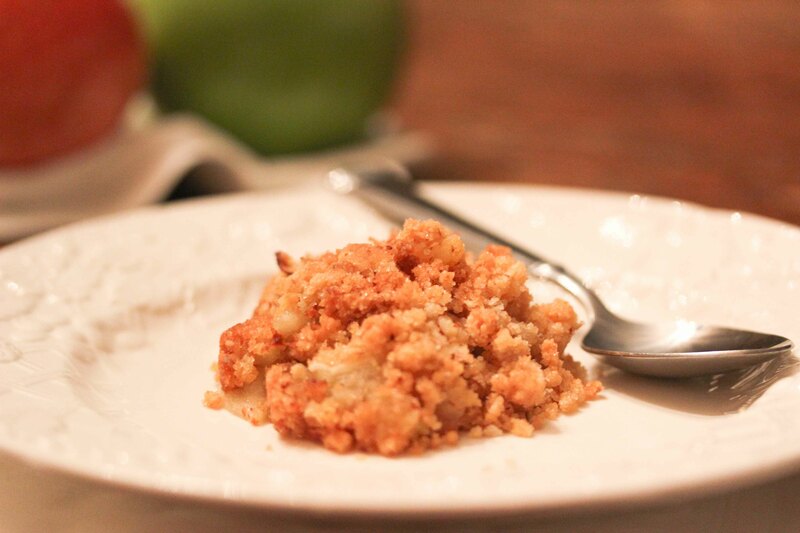 Love apple crumble! Hope you enjoy a beautiful Passover and that you can sneak in a few cat-naps along the way. The top photo is gorgeous! I especially love the way you placed the apples on the napkin. The colors are beautiful, and the napkin fold gives it such a great causal look — almost like they just happened to be hanging out there. Thanks so much for letting me know! I’m glad you enjoyed it. Miriam, can you suggest a substitute for the almond meal. We have tree nut allergies. The 1/2 cup is too large an amount just to leave out, I know. I would love to try this. It looks great! Are any nuts an option? If so, use other nuts. If not, is it for Passover? If no, try flour. If yes, matzoh meal. I was thinking in terms of Passover recipes (ok, so I am thinking a little ahead). All tree nuts are out, so I will give matzoh meal a try. Thanks! These crumbs are amazing! I am using them for everything! Will a 9″ round pan be ok? Looks delicious! Exactly wat I was looking for.. Thanks for posting!!! Hi, Looks great. Do you think I can you this as a desert with vanilla ice cream? also does it freeze well? Ladyfingers? Not kosher for Passover! Nancy, many kosher grocery stores sell a special kosher-for-passover version. Just printed this and a bunch of other recipes. Looking forward to trying them! In Israel we don’t have Kosher for Passover ladyfingers. What can be used instead? Hi. Can I use yellow apples for this recipe, miriam? Can I use 2 cups matzo meal instead of ladyfingers and almonds? You can try, but it will completely change the recipe (no guarantees!). Would like to increase ingredient quantities to achieve more volume in the 13 by 9 pan. Has anybody done this? Increase everything including baking powder by 1 1/2 Times? What do you think about baking time? Double it for a 9×13. Increase baking time as needed.